The nominations for the 64th Primetime Emmy Awards were announced in Los Angeles this morning and our favorite, Downton Abbey, received 16 nominations—including three in major categories. This year the show is nominated for outstanding drama series as opposed to outstanding miniseries or movie, which it won last year. Michelle Dockery, who plays Lady Mary Crawley, and Hugh Bonneville, who plays Robert, Earl of Grantham, are up for lead actress and lead actor in a drama series. In addition, Dame Maggie Smith, who plays Violet, Dowager Countess of Grantham, and Joanne Froggatt, who plays Anna, are both nominees in the category of supporting actress in a drama series. Brendan Coyle, who plays John Bates, and Jim Carter, who plays Mr. Carson, are up for supporting actor in a drama series. Vying for outstanding drama series with Downton are Boardwalk Empire, Breaking Bad, Games Of Thrones, Homeland and Mad Men. 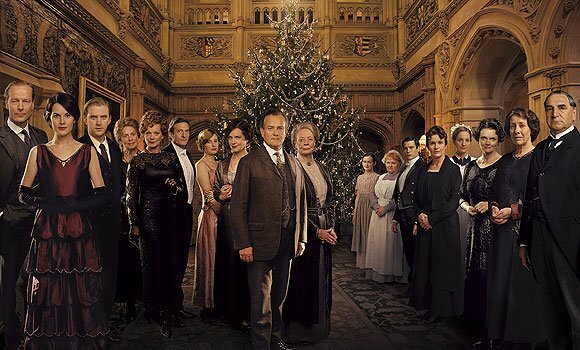 Downton Abbey is also nominated in the categories of outstanding directing, writing, art direction, casting, costumes, editing, hairstyling, music composition, and sound mixing. Last year Downton took home six awards for outstanding directing, writing, cinematography, costumes, and miniseries or movie; Maggie Smith won supporting actress. Season 3 began filming in February and is set to be broadcast in September in the UK and in January 2013 in the US. It will follow the characters during the first 18 months of the Roaring Twenties. We eagerly await the return of Downton Abbey and hope it fares well at the Emmy Awards, which will be handed out on September 23.